In my world, there is no finer snack than some chicharrones, a.k.a. 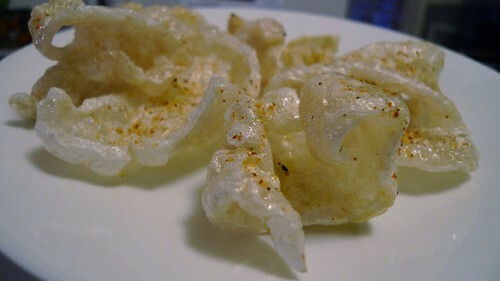 fried pork rinds. It’s something I’ve been eating since I was a kid, and Filipinos love it with sukang sili (chili vinegar) and beer. 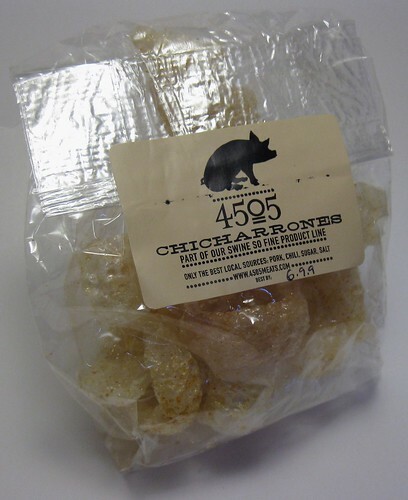 Over the past year, chicharrones have been embraced by the “mainstream” through the efforts of chefs like Ryan Farr of 4505 Meats, whose chicharrones, despite my initial apprehensions, are other worldly. They’re incredibly light and when they’re fresh, they snap, crackle, and pop in your mouth like porky Rice Krispies. Because they’re so cheap and readily available near me, I’d never considered making chicharrones at home until a couple weeks ago. I had some pork skin left over after removing it to making the Momofuku Pork Belly, and it would be a shame to waste such a nice piece of pork skin. There’s also a recipe in the Momofuku cookbook since they serve a piece of chicharron to every guest as an amuse bouche at Momofuku Ko. The process is pretty simple. First, put the pig skin in a pot of water and boil it for about an hour a half, then chill it in the refrigerator for a few hours. Pig skin after chillin’ out overnight. Use a spoon to scrape off any excess fat left on the skin and put it in a food dehydrator for 12 hours. It should look like a brown piece of plastic. Break this into small pieces and fry them up. 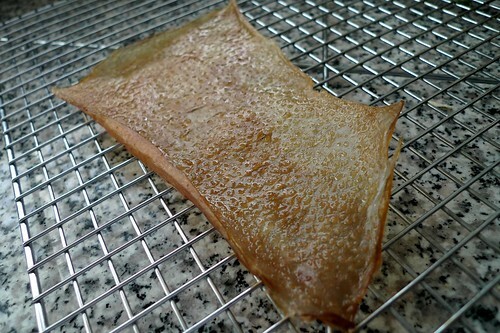 Next, break the dehydrated pig skin into 1×2-inch pieces. This doesn’t have to be exact, as the small pieces make nice chicharrones, too. Heat some oil (preferably one with a high smoke point) to between 390-400F in a deep pot. Drop a piece of pig skin into the oil and agitate it a bit until it puffs up. This should take about 10 seconds. Fry each piece one at a time, so they don’t stick together. Here’s a short iPhone video I shot to give you an idea of how long it takes. I’m sure yours taste 100 times better, but I’m hooked on the Microwave Pork Rinds (can buy on Amazon)! LOL! Your chicharon looks awesome. I love it but try not to eat it too often. Hehe. Arnold, my man, that looks divine. Seriously divine! That’s off the chain! Kudos :) love the video too! *nom nom nom* Looks like you achieved pork rind success! Is that a Ron Popeil food dehydrator? ;P The chicharron looks awesome Arnold! I have no food dehydrator, so I wonder how the skin would fare if that step was skipped. When I made bagnet, the skin crisped up fine after a stay in the fridge. Though with the extra moisture, there was a lot of sizzling. It seems so easy to make when reading through. I love chicharrones made from different recipes especially the spicy ones. Three words: SO FREAKING GOOD. @Connie: Have you been to Animal in LA? They do some good crispy pig ears there! A-everything on Inuyaki is so amazing right now! I love this video. 4505’s really are transcendent…how does making your own compare, taste-wise? Does anyone know what kind of oil commercial pork rinds are fried in? Hello, I’m glad to find these site. I hope I’m not too late for an reaction. After a vacation in Mexico, I want to try that chicharonne (duritos). But, I live in The Netherlands, and sun is very expensive here . So I go to the butcher and order, only pork skin, and yes, he want do it. Cost me 1 Euro/kilo. And here I make a mistake, I try to scracth and clean the skin, while it is hot from the pan. So, there are still many fat etc on the skin. You tell here, first chill in frigidaire, ayayayaya, now I know. But I’ve not do that. But in the meantime, I had to throw in garbage 2 kilo dry skin, because that fat taste bad, after too long dry outside, and not clean it more then I did after boiling. And let me tell you, 1 kilo of dry, is 5 kilo fresh, again ayayayaya . So this week, I decide to order a food dehydrator. And here I see the result, that brown color is what I reconize how it see in Mexico. 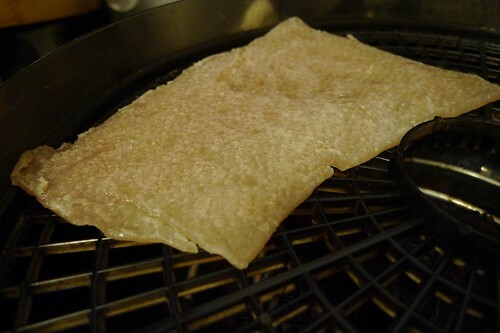 My pork skin have a pale color. Not yet received the hydrator, so I wait. So, when my English is not perfect, is not my fault  is not my main language, and because u not undertsand Dutch, so I do it in English. Anyway, fine to find these site. Thank you for this post! I shall have chicharon next Lakers game! Salamat! Food Blogger Spotlight: Arnold Gatilao � Wasabimon!